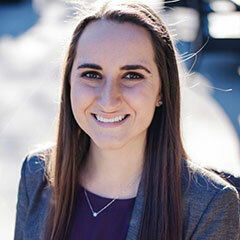 Sydney Haas, a December 2018 bachelor's candidate in finance and management with minors in economics and leadership studies, is the Kansas State University College of Business Administration's Outstanding Senior in Business for fall 2018. Haas, Overland Park, has been an ambassador and an exceptional student scholar as an undergraduate. She has served as a Business Ambassador, the president of the Investment Club, the controller of the Student Finance Association, accounts payable for Pi Beta Phi, and a mentee in the Executive Mentor Program. For the past two years Haas has been the lead tutor for Finance 450, helping coach students through the course. Outside of the college, Haas has served in leadership roles since 2014 on the K-State Relay for Life committee and helped raise funds to benefit cancer research. "It has been my pleasure and honor advising Sydney over the past four years," said Lindsey Cordill, academic advisor in the College of Business Administration, who nominated Haas for the award. "She is a model student and has been dedicated to everything she has been involved with in the College of Business Administration, including her classes, campus activities and professional experiences. Sydney is truly outstanding and I am excited for her future as she starts her career." Following graduation, Haas will begin her career at Stepp & Rothwell Inc., a financial planning firm in Overland Park. Haas is the daughter of Kelley and Tim Haas, and a graduate of Blue Valley Southwest High School.